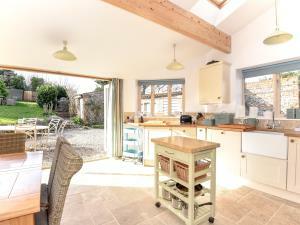 Well Cottage01263 456888work Self-cateringA tastefully refurbished flint cottage with spectacular views across the marshes, in the delightful village of Salthouse with a good local store, seafood cafe and great pub within walking distance. This spacious retreat sleeps 2 – 8 guests, with three bedrooms in the main house sleeping 6, and a one-bedroom annexe outside, which can be rented for an additional sum. Well Cottage has been beautifully furnished and decorated to give a welcoming and relaxed feel as soon as you step inside. The large kitchen area has the benefit of full glass folding doors which lead out on to the garden, making it a perfect summer retreat. In the winter, there’s nothing more relaxing than snuggling up on one of the comfy sofas in front of the wood burner with a glass of wine and good book. With a bedroom and bathroom downstairs, this bolthole has good access for those who may find stairs a challenge. The upstairs sleeps a further 4 in beautifully furnished bedrooms and features a bathroom with underfloor heating. The cottage is located up a quiet lane away from the main coast road, making it a relaxing and peaceful base to explore this area of outstanding natural beauty. Shop/pub within walking distance. Kitchen/Diner with comfortable seating area for 6/8 guests, gas range cooker, dishwasher, microwave, fridge, freezer, washing machine. Stone floor with underfloor heating. Folding glass doors open directly onto the garden. Sitting Room with plenty of comfy seating, woodburner, large flat screen TV with Freesat, DVD player, DVDs, games, under floor heating. Bathroom with a shower, period style WC and basin, heated towel rail. Bedroom 3 is a twin-bedded room with 2ft 6” beds and a wardrobe. Bedroom 1 with King sized bed, wardrobe, bedside tables, dressing table and view towards the marshes. Bedroom 2 with King sized bed, built in wardrobe and bedside tables. Bathroom with period style bath and shower head over, period style WC and basin, heated towel rail. Kitchen/diner/living area with sofa, TV, cooker, fridge, microwave, door to garden. Folding doors open directly onto a gravel patio area and the raised large grassed lawn area. The outdoor seating area with large wooden table and six outdoor wicker chairs gives views across the marshes towards the sea. BBQ. Garden airer. Log store. The garden is enclosed with a gated entrance leading onto a parking area for two cars. Oil central heating, underfloor heating and woodburner. A tastefully refurbished flint cottage with spectacular views across the marshes, in the delightful village of Salthouse with a good local store, seafood cafe and great pub within walking distance. This spacious retreat sleeps 2 – 8 guests, with three bedrooms in the main house sleeping 6, and a one-bedroom annexe outside, which can be rented for an additional sum. Well Cottage has been beautifully furnished and decorated to give a welcoming and relaxed feel as soon as you step inside. The large kitchen area has the benefit of full glass folding doors which lead out on to the garden, making it a perfect summer retreat. In the winter, there’s nothing more relaxing than snuggling up on one of the comfy sofas in front of the wood burner with a glass of wine and good book. With a bedroom and bathroom downstairs, this bolthole has good access for those who may find stairs a challenge. The upstairs sleeps a further 4 in beautifully furnished bedrooms and features a bathroom with underfloor heating. The cottage is located up a quiet lane away from the main coast road, making it a relaxing and peaceful base to explore this area of outstanding natural beauty. Shop/pub within walking distance.